Less than three weeks until Mother’s Day! If I want to remain happily married for another 17 years, I know what I’ve got to do. Come up with a fabulous gift to show my mother in law what an amazing wife her son chose! 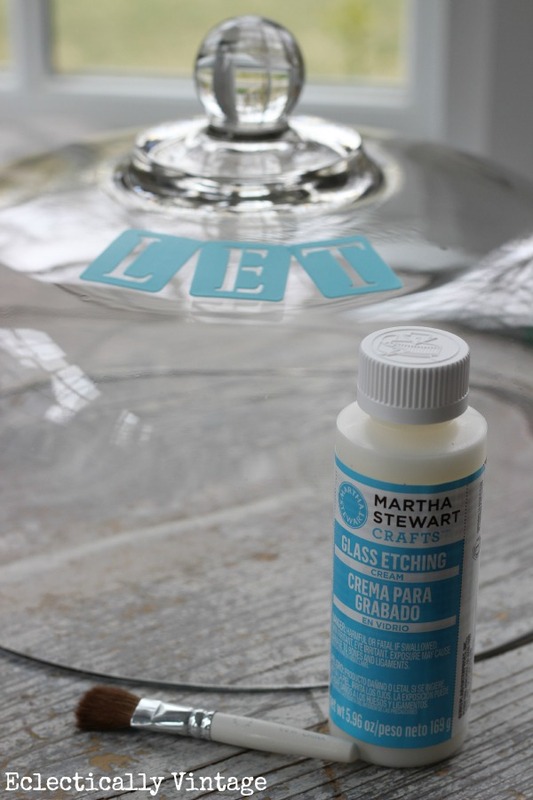 Simple craft idea to the rescue – how to etch glass! There’s nothing my mother in law loves more than cake. Diamond pendants, Coach purses, mani/pedis? I know the way to my mother in law’s heart and it’s through her stomach. How do you think I’ve managed to stay peacefully married for so many years? So I’ll fill a plate with cakes, brownies, cookies and pastries and she’ll look lovingly upon me and say, “we are so lucky to have you in our family”. She’ll probably just say thanks and then start devouring the goodies but a girl can dream can’t she. P.S. 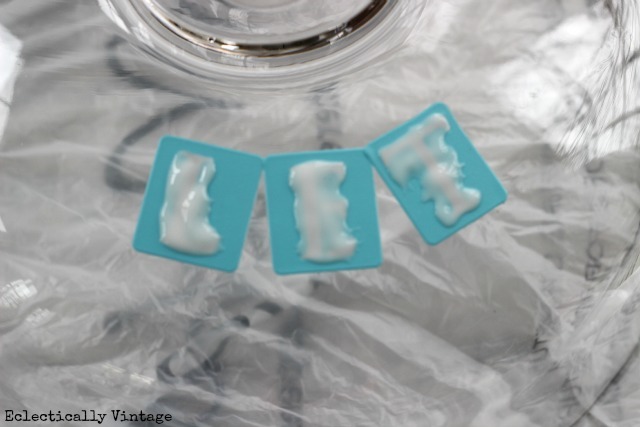 I love this almost as much as I love my stamped silver spoons – I’m sharing how to stamp silver. What a great idea Kelly! My son is getting married next month and going to showers over and over again, I’m running out of gifts (not to mention money) and this will fit the bill! 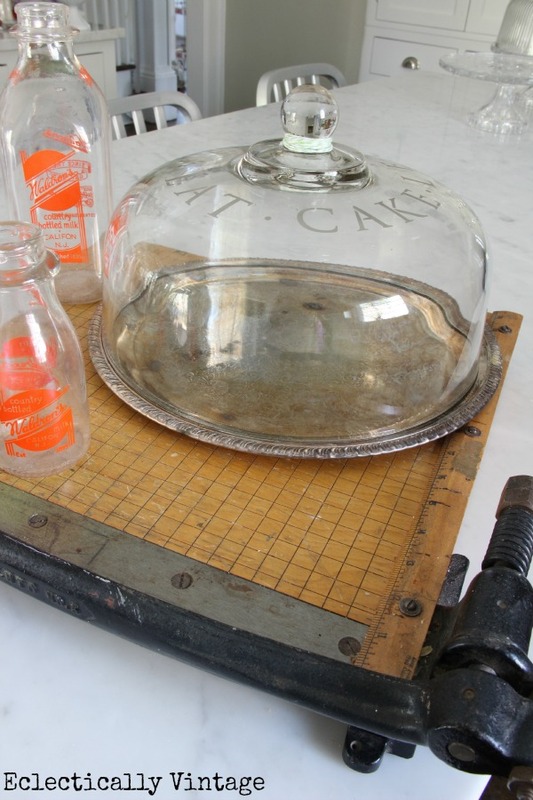 I already have the etching kit so all I need is a cake plate cover – wonder if my mom will give her’s up?!?!? What a great idea. I love this and may just have to do for mom! What a great project…pinned! I need to do this one! I’ve got the glass cake dome. I’ve got the metal bottom. I could make a cake. So I think I will pin this then keep it for myself since around here I’m the one who’s heart is via stomach. Better yet… perhaps I should send this link to my daughter in law? That is SO cute! What a great idea … I’m sure your mother-in-law will love it! This is so cute! Your Mother n law will love you more. Was it dfficult to line up your stencils? Thanks Laura and the stencils were a cinch to line up. They peel off easily if you need to adjust them too. Marie Antoinette would have been proud! I just got a gift for a bridal shower yesterday….a toaster oven….LOL! This would have been so much cuter! I love this! I It looks like something you bought at a spendy boutique. Very cool! I am still trying to figure out what I want to make for Mother’s Day. This is so unique and I love the “let them eat cake”! LOVE this tutorial! I am soooo going to do this! Thank you! You’re ideas are always so clever and full of a healthy dose of whimsy … let them eat cake 😉 As with all you do and create, I love this. I absolutely LOVE your new cake dome! What a great idea and a great job! I love this Kelly! I think your mother in law and mine may be related. 😉 This is a fantastic Mother’s Day gift! 🙂 Thanks for sharing! I’m sure she will love it. So pretty! I love etched glass…so pretty and makes a great gift, too. Very cool idea Kelly! Your glass cake dome looks great! How fun! I am hosting a craft night at my house this week and we will be etching glass. I’ve never done it before! Love this idea. Love this, Kelly! I’m totally stealing your idea for my own mother in law…she will love it! Really cute Kelly and looks so professional, You will make your Mother In Law very happy. This is fabulous! Thanks for sharing how to do this. I’ve never tried glass etching, but it’s been on my mental to-do list for a long time! Now, I think I could be brave enough to try it! I really have to get this etching stuff. Lovely gift, I’m sure any woman would love something like this! I just got my first cake dome ever (I feel so grown up now!) and I am totally doing this project! Thanks for sharing, Kelly!! This is a great idea! I love how clean and simple the style is, yet it looks so special. Adorable! Such a fun idea. This project was a blast and I’m all about etching everything now, so simple and fun. Great project Kelly!! Love it :))) Let Them Eat Cake… lol. Just love it!! I have seen this product but never tried it. Will be trying now! My mother in law lives closer to you than me. Mother’s day is all about me around here. Me, me, me, me, me, me. My kids asked me what I wanted. I told them a day to do nothing, with no one bothering me. That is stunning!! what a great idea! 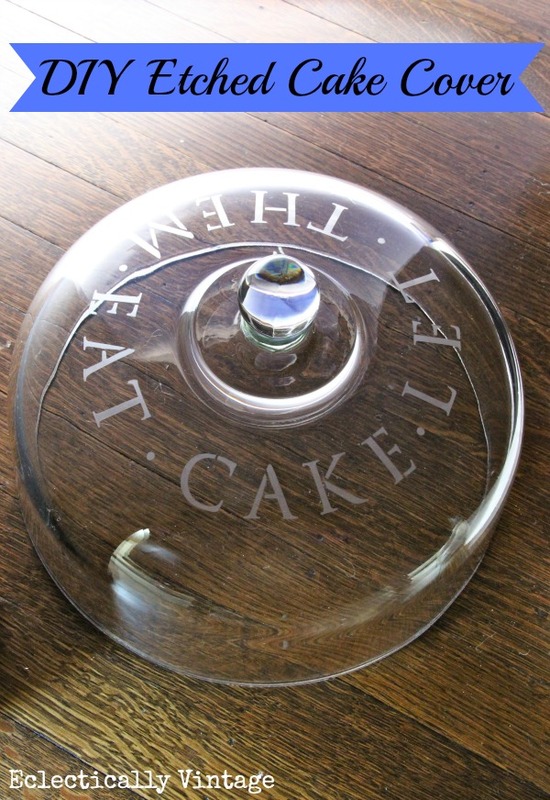 I have got to find a cake cover and do that…..
this is such a good idea gift for showers & weddings! love it. I’ve always wanted to use that glass etching thing! It’s definitely on my crafting to do list! Kelly, I love the cake stand cover!! I’ve been wanting to try the etched glass project and this has definitely inspired me. It turned out great!! Pinning this one! You crack me up Kelly! Your mother in law lucked out when her son found you!! This is a great gift and she will be in heaven! I hope you get lovely gifts for Mother’s day too! I LOVE it! I’ve been trying to find a way to personalize glasses for each member of the family so that we can have “all day cups” around here without getting them mixed up. This is perfect! Great job on this cake cover! I, too, love to stencil on most anything and stenciling on glass turns it from plain to special! How fantastic! Does this hold up to washing as well? Yes – it can be hand washed or go right into the dishwasher! Thanks, Kelly! Can’t wait to try several fun things from your site…love it and thanks for the fast response! Hi, I want to do this project but the stencils that are linked are about 1\2 inch tall. Yours look bigger, can you tell me if you have a different size? These two crafts sound great. Can’t wait to try them. I do lots of different things and go to crafts sales to sell them. I’ve done all kinds of bird feeders, bird houses and birdbaths. It’s time to try something different. Glad you like Carrol – happy new year! Kelly Kelly Kelly wow fist of all I want to start shopping with you. 5 dollar table are you kidding me. Wtg I’m bowing at this time. I ju.st love how you itch that on the pie/cupcake plate top. I’m not sure but must of missed the degree cooking time on this. Love the saying on it too. Hi Mary – you don’t put this in the oven! Just apply the etching cream, wait 15 minutes and rinse off!